This seems like a good time to give my classical music soapbox speech yet again. There are thousands of examples in varying themes and styles within classical music. Give the Baroque, Classical and Modern periods of orchestral music a chance and I’m sure you will find something you absolutely love. That being said, I would highly recommend you do NOT begin your journey towards classical appreciation with a harpsichord piece. All of this information to state that I’m incredibly biased towards piano, and since the harpsichord accosts my ears like an out of tune, thin throated piano, it just isn’t my cup of tea. You may love it though. As I’ve studied Bach and harpsichord in general, I’ve become incredibly impressed with the level of skill it took to play the multiple voices and counter melodies within Bach’s music. I don’t think I’ll ever fully love the tone of this instrument though. 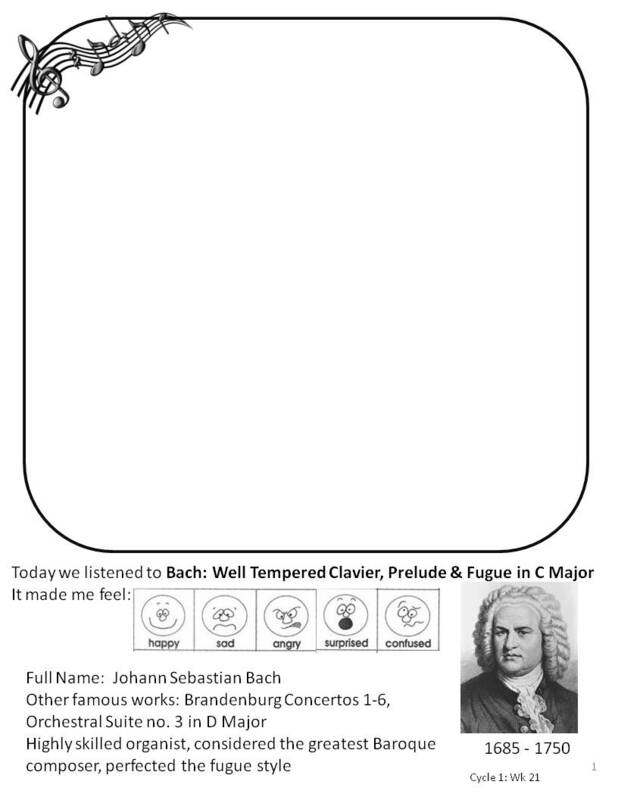 I can’t fault Bach for creating pieces for harpsichord, since piano’s didn’t exist in Germany when he started composing. What’s a guy gonna do? Bach was born in 1685, the son of a court trumpeter. Unlike many musicians, his parents didn’t have aspirations to send him off to law school, instead teaching him to play violin, harpsichord and organ from a young age. 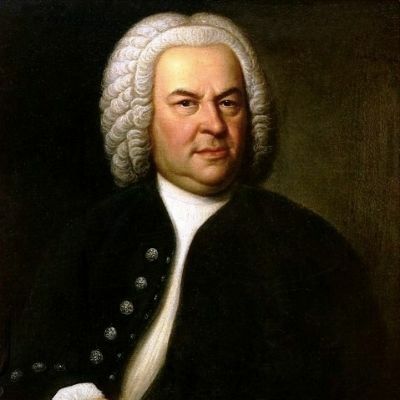 After both his parents died within a year of each other, the nine-year-old Bach went to live with his older brother, who continued his musical education. Most of Bach’s compositions were written for church services. Performed once and then thrown away, the majority of his works were not published in his lifetime. Because he composed new music constantly for services, his volume of compositions is virtually unmatched among composers. The harpsichord couldn’t produce volume like a modern piano. The strings were plucked rather than struck with a hammer, and as such there was no dynamic changes from note to note. Chords were rolled (played one note after the other quickly, instead of all together) to simulate more volume. You’ll see a chord and a soccer ball in the listening map to show where there are rolling chords. This piece has two distinctive parts. The Prelude, and the Fugue. During the prelude, listen for the melody to go in multiple directions at once, called counterpoint. 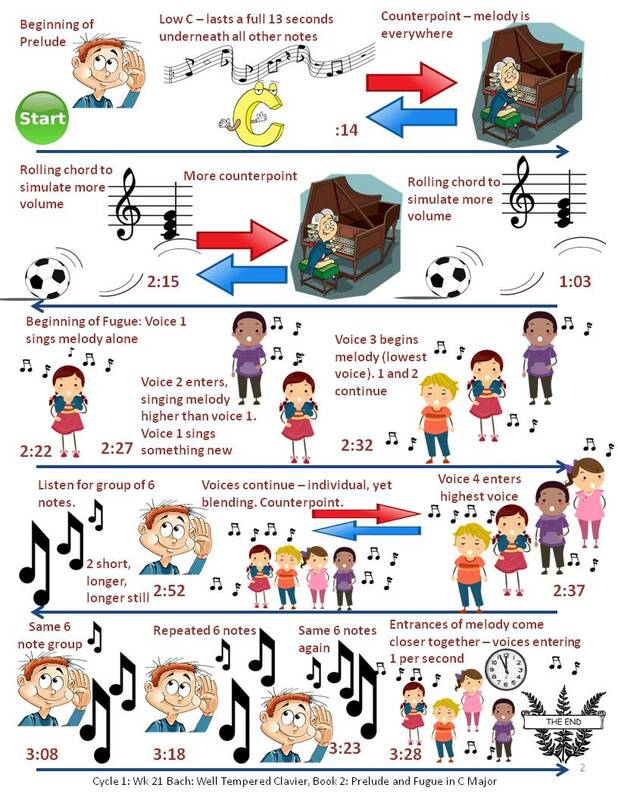 A fugue is a composition where a short melody or phrase is introduced and then taken up by multiple voices, each developed and interwoven together. This fugue is played by the harpsichord and because there’s little dynamic range, it can be a little challenging to pick out the higher and lower “voices” of each rendition of the main melody. I found this visual listening map for Bach’s Little Fugue incredibly helpful. You’ll see each voice represented in a different color as the piece moves along. Once you’ve watched this short video, you’ll be much better equipped to hear the voices in the Well Tempered Clavier piece. A side note. The Little Fugue in the above video is played on an organ. The lowest voice (purple) is played with the organist’s feet! What?! Craziness! Watch here at :52 seconds to see it with your own eyes! As you listen to Bach’s Well Tempered Clavier, try to pick out the six noted melody that enters at 2:22 and continues, repeated over and over through the piece. Even as there are 4 “voices” with notes going everywhere, you can hear the simple structure of that first melody. If, upon hitting the play button below, you are experiencing your first brush with all that is the awful harpsichord…my deepest apologies. Be impressed with the technical skill it requires to play four voices with only two hands. Focus on the intricate rhythms instead of the horrid tone. Try. If I can do it, so can you. As always, I’ve included a coloring page and listening map for you to print.